resourceful, diligent, intuitive and loyal communications partner to be on your team. Whiteworks develops and generates communications strategies to achieve marketing, promotional, corporate and publicity objectives in a cost effective manner. An integral part of your team. 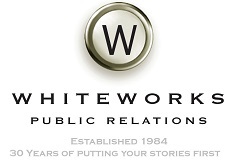 Whiteworks prides itself on its long-term relationship with its clients and its integral role in their successes. Whiteworks Public Relations is a member of the Public Relations Institute of Australia’s (PRIA) Registered Consultancy Group (RCG). Copyright © 2019 Whiteworks Public Relations. Hosted by Planet HomePage.